Simple Spinach Salad, Thyme for Cooking healthy gourmet side dish. 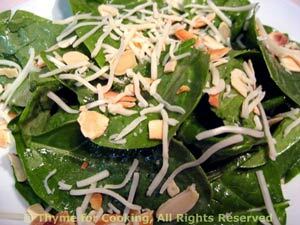 A heart-healthy salad, that's also good for the eyes (spinach: lutein) and the bones (spinach, almonds and cheese: calcium). Plus it's delicious! What more can we ask for? Wash spinach if necessary, tear and put into a salad bowl. Add almonds, salt to spinach and toss to combine. Add half of the vinaigrette and toss to coat. Taste and add more as needed. Serve, remaining vinaigrette on the side. Put all remaining ingredients except olive oil in small bowl and whisk to combine. Slowly drizzle in olive oil, whisking constantly. This will keep about a week and can be used as a base for other vinaigrettes.